A touchdown for sports travel advertising! Recently we were approached by a new company about to launch their business as a US sports travel agency. MVP Travel is a new, niche travel agency, providing sports based holidays to the US. 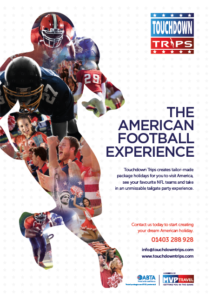 For those who are interested in American football, basketball or baseball and would like to travel to watch a game or two, MVP Travel provide the ‘inside track’ and local knowledge to maximise the authentic fan experience, enabling clients to travel in comfort, take in a tailgate party or two and get them prime seats at key games. To promote their launch, Design Inc were requested to design concepts for US-based sports travel advertising, for the parent company (MVP Travel) and also for each of their discreet sports specific companies (Touchdown Trips, Homerun Trips & Slamdunk Trips). Our solution was to create a sports travel advertisement that showcased the excitement of the total US sports experience. This was achieved through the creation of a background montage graphic consisting of relevant US sports imagery. On top of that we laid a cut out in the shape of a sports player so that it acted as a window through which a certain area of the montage backdrop would appear. Depending upon the sports player’s silhouette shape and whereabouts on top of the montage graphic it laid, a different image was seen. The montage had areas for all sports and some specific areas for American football, basketball or baseball – depending upon whether the advert was the parent company or for one of the subsidiary companies. The end result was striking! ‘As a start-up, we are at the beginning stages of brand development. We approached Design Inc for some assistance on two USA holiday, sports travel advertising opportunities that presented themselves within a week’s time. Design Inc not only rose to the challenge of some tight deadlines, they also quickly became a collaborative partner and helped develop our look through imagery and design. Our two initial ads were similar but different. The first was for our NFL focused subsidiary Touchdown Trips and the second was for the parent company. Design Inc was able to identify the brand strengths and capitalise on the experience and emotion that is paramount in our customer proposition. The ads have just the right amount of similarity to show they are affiliated but each expresses the right targeted message for the individual company.